The Medical Online Incorporation Certificate for Hospitals and health care organizations is being issued to a particular medical organization reiterating the medical competency and healthcare providing capacity. This valuable certificate is valid for a period of three years from the date of registration under Medical Online. Even if the registration is not renewed after the completion of the second year, the registration would be converted into the basic package providing amenities for the concerned medical institution. 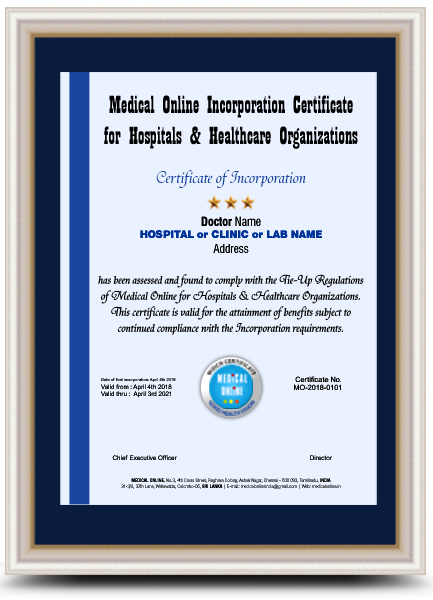 The certificate stands to convey that through registration and obtaining the Medical Online Incorporation Certificate for Hospital & health care organizations, Appointment, Consultation and Doctor’s Opinion could be obtained with special privileges through Medical Online. This enables the Doctors and the hospitals to render medical services in a professionally benevolent and best of methods to the patients based on latest upgraded technologies. The patients would be in a position to identify the facilities provided by the Medical Online and they would be eligible to avail all of the benefits ear-marked.